There is a misconception that all advances in yacht design spring only from the minds of brilliant designers and the hands of skilled builders. However, there would be no progress without forward-thinking superyacht owners who inspire and support new ideas. Nothing progresses beyond the drawing board unless someone is prepared to take the risk and pay the bill. Jack Setton in one of yachting's most distinguished owners because for over 40 years he has taken up this challenge and consistently ordered or built highly innovative and influential power and sailing yachts. Setton's first boat As a young man, Jack Setton was fascinated by fast boats and fast cars while his father Joe was an exceptional sport pilot. 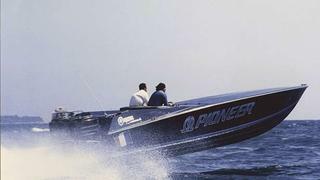 When Don Aronow burst on to the offshore powerboat racing world in 1966 with his Magnum designs, Jack and his father thought they could improve on the Magnum 27 by eliminating its expensive inboard gasoline engines and stern-drive system and replacing them with high-powered outboards driving a much lighter hull. The result was the Setton Bullit 298 (pictured) which was designed in France and built under licence in Florida. This boat, which was mostly Joe Setton's project, attracted the attention of the US Navy which was looking for a fast boat that could be dropped by parachute from a Hercules aircraft. The Bullit was the only one to meet the requirement. Meanwhile, back in the Mediterranean, Jack bought a 25 metre Italcraft, with hull design by Sonny Levi, who was a top designer of offshore racing powerboats at the time. With twin MTU engines and surface drives, this could do 54 knots and was one of the first really fast diesel boats. There is a misconception that all advances in yacht design spring only from the minds of brilliant designers and the hands of skilled builders. However, there would be no progress without forward-thinking superyacht owners who inspire and support new ideas. Nothing progresses beyond the drawing board unless someone is prepared to take the risk and pay the bill. Jack Setton in one of yachting's most distinguished owners because for over 40 years he has taken up this challenge and consistently ordered or built highly innovative and influential power and sailing yachts. As a young man, Jack Setton was fascinated by fast boats and fast cars while his father Joe was an exceptional sport pilot. When Don Aronow burst on to the offshore powerboat racing world in 1966 with his Magnum designs, Jack and his father thought they could improve on the Magnum 27 by eliminating its expensive inboard gasoline engines and stern-drive system and replacing them with high-powered outboards driving a much lighter hull. 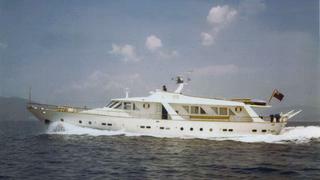 The result was the Setton Bullit 298 (pictured) which was designed in France and built under licence in Florida. This boat, which was mostly Joe Setton's project, attracted the attention of the US Navy which was looking for a fast boat that could be dropped by parachute from a Hercules aircraft. The Bullit was the only one to meet the requirement. Meanwhile, back in the Mediterranean, Jack bought a 25 metre Italcraft, with hull design by Sonny Levi, who was a top designer of offshore racing powerboats at the time. With twin MTU engines and surface drives, this could do 54 knots and was one of the first really fast diesel boats. Other powerboats that Jack Setton tried out or owned included a Hatteras 53 Sportfish and the fabulous Riva Superamerica. Following this high-speed entry to the powerboat world, Setton says he had a lot of different boats but at the age of 30 began to take an interest in big-boat cruising and bought a 28 metre CRN named Sea Shanty _(pictured, now named _Gold). This was soon followed by the first Belle France (now Macanudo), a 30 metre Esterel that Setton redecorated and improved. The Esterels had beautiful mahogany hulls based on a patrol boat design by André Mauric and with relatively narrow beam were very smooth to windward, but rolly in a beam sea. Other powerboats that Jack Setton tried out or owned included a Hatteras 53 Sportfish and the fabulous Riva Superamerica. Following this high-speed entry to the powerboat world, Setton says he had a lot of different boats but at the age of 30 began to take an interest in big-boat cruising and bought a 28 metre CRN named Sea Shanty _(pictured, now named _Gold). 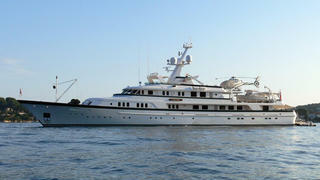 This was soon followed by the first Belle France (now Macanudo), a 30 metre Esterel that Setton redecorated and improved. The Esterels had beautiful mahogany hulls based on a patrol boat design by André Mauric and with relatively narrow beam were very smooth to windward, but rolly in a beam sea. In 1990, Setton bought the 58.9 metre Feadship Cacique which became the second Belle France (now Minderella) and took him on two world cruises. While enjoying the comfort and style of the Feadship, he gradually came to the conclusion that this type of yacht had certain basic faults: that it was too big to explore close inshore, not able to carry large tenders and was expensive to run and maintain. He began to think about a mothership that would be comfortable, seaworthy and able to carry a variety of smaller craft; including a 12 metre powerboat, capable of making short independent cruises. Together with German project manager Claus Kusch, Setton began searching for a suitable vessel to convert and came across the 77.7 metre ice-classed deep-sea tug Simson (now Sea Ranger) which was sent to Malta for a radical conversion. With the towing gear removed, the characteristic long afterdeck could be adapted to carry a variety of smaller craft - like the Nelson 42 Setton chose for inshore cruising. The tugboat could easily carry the Nelson's 14.5 tonnes weight but launching or recovering it by crane if the ship was rolling was nerve-racking. This led Setton to conclude that he should build a special vessel that would combine the advantages of the tug and a yacht such as Belle France. The result was Senses, a 57 metre motor yacht that Setton compares to a Hummer - a car that can go anywhere comfortably - and went a long way towards defining the true role of the expedition yacht. Completed in 1999, Senses was designed to carry a variety of tenders but in a compact hull that provided more accommodation, was more easily managed and more economical to run. Setton was highly involved in the design and spent many hours at the Martin Francis design office at Sofia Antipolis, France, working to refine both the layout and outboard appearance. The question of how to launch or recover the Nelson in a seaway was solved by the builders, Schweers, which patented a ramp system used for North Sea lifeboats. Senses now belongs to Google co-founder Larry Page who bought it from Sir Douglas Meyer in 2011 with both owners choosing to retain her name. Together with German project manager Claus Kusch, Setton began searching for a suitable vessel to convert and came across the 77.7 metre ice-classed deep-sea tug Simson (now Sea Ranger) which was sent to Malta for a radical conversion. With the towing gear removed, the characteristic long afterdeck could be adapted to carry a variety of smaller craft - like the Nelson 42 Setton chose for inshore cruising. The tugboat could easily carry the Nelson's 14.5 tonnes weight but launching or recovering it by crane if the ship was rolling was nerve-racking. This led Setton to conclude that he should build a special vessel that would combine the advantages of the tug and a yacht such as Belle France. The result was Senses, a 57 metre motor yacht that Setton compares to a Hummer - a car that can go anywhere comfortably - and went a long way towards defining the true role of the expedition yacht. Completed in 1999, Senses was designed to carry a variety of tenders but in a compact hull that provided more accommodation, was more easily managed and more economical to run. Setton was highly involved in the design and spent many hours at the Martin Francis design office at Sofia Antipolis, France, working to refine both the layout and outboard appearance. The question of how to launch or recover the Nelson in a seaway was solved by the builders, Schweers, which patented a ramp system used for North Sea lifeboats. Senses now belongs to Google co-founder Larry Page who bought it from Sir Douglas Meyer in 2011 with both owners choosing to retain her name. Setton's next motor yacht, the 32 metre Pink Shrimp, features an open cockpit aft and a raised driving position with two armchairs under a folding Bimini sunshade. There is a compact but comfortable cabin with a double bunk under the driving position, a dinette, shower room and a small galley. Under the cockpit a pair of Cummins 600hp diesels are connected to jet drive units. 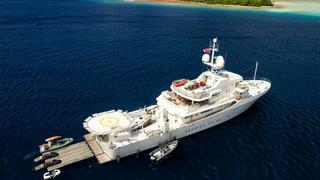 This remarkable vessel is capable of cruising at 40 knots and has a range of over 400 nautical miles at that speed. After dabbling in sailing yacht racing with a number of smaller vessels Setton became fascinated by the impressive design of aluminium sloop Kriter VIII which introduced to him the idea of an ultra-light displacement boat (ULDB) and so he asked Andre Mauric to design a 24.9 metre modified version in which the lines were filled out a little to make it more powerful to windward. 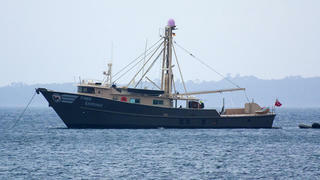 This yacht, named Pioneer (now Amaalta), was fitted with a pair of outboard motors instead of the usual inboard diesel. This not only saved weight but was efficient, had no drag while sailing, gave fantastic manoeuvrability in port and resulted in a speed under power of 17 knots. Setton found that he could sail this yacht with just one other person and it went a long way to satisfying his desire for a sailing yacht with high speed but minimal crew. A spin-off from this yacht was that he went to discuss the mast and sails with Ted Hood and ended up making a substantial investment in his company. After dabbling in sailing yacht racing with a number of smaller vessels Setton became fascinated by the impressive design of aluminium sloop Kriter VIII which introduced to him the idea of an ultra-light displacement boat (ULDB) and so he asked Andre Mauric to design a 24.9 metre modified version in which the lines were filled out a little to make it more powerful to windward. 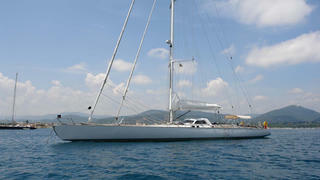 This yacht, named Pioneer (now Amaalta), was fitted with a pair of outboard motors instead of the usual inboard diesel. This not only saved weight but was efficient, had no drag while sailing, gave fantastic manoeuvrability in port and resulted in a speed under power of 17 knots. Setton found that he could sail this yacht with just one other person and it went a long way to satisfying his desire for a sailing yacht with high speed but minimal crew. A spin-off from this yacht was that he went to discuss the mast and sails with Ted Hood and ended up making a substantial investment in his company.